The breakdown shows the deterioration in comparison to last year can be mainly attributed to expansion in the trade deficit reflecting the impact of higher oil prices on average, weakening net gold trade as well as the ongoing strength in domestic demand. On the flipside, further recovery in services income, which was under pressure in 2016 on the back of weakness in net tourism revenues helped the September current account balance. Net tourism revenues reveal a 33% year-on-year increase in gross revenues, while tourism spending of Turkish citizens recorded an increase of 34%, rapidly growing in the last three months at double-digit rates. 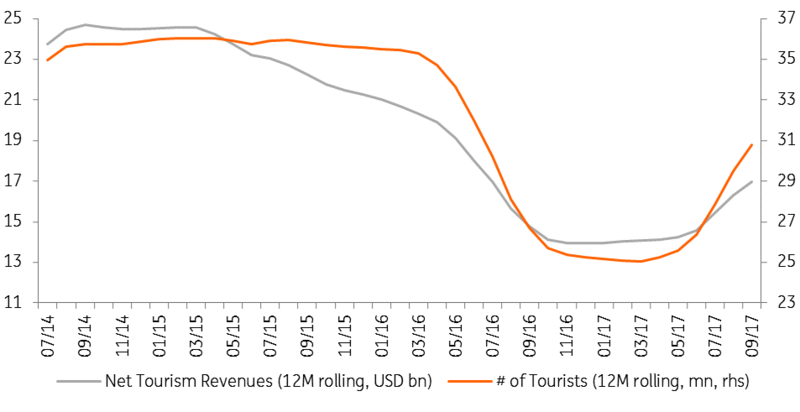 Note that the rise in tourism revenues lags behind the growth in tourist numbers. This is likely due to the composition change in tourist flows since tourists coming from Russia (with an almost eight-fold increase this year on a cumulative basis) and MENA, who do not spend much, make up a higher share than those from Western Europe. Accordingly, we saw an expansion in the annual current account deficit to USD 39.3bn from USD 36.3bn a month ago. On the financing front, September saw some weakening in inflows, standing at a USD3.8bn, likely attributable to bottoming US rates, ongoing geopolitical risks and a worsening inflation outlook. With USD1.7bn net errors and omissions (accelerated again after from May onwards), official reserves recorded USD0.9bn increase. In the breakdown of the capital account, a rise in locals' assets held abroad of USD0.5bn mainly via deposits and direct investments contributed to weak flow outlook. 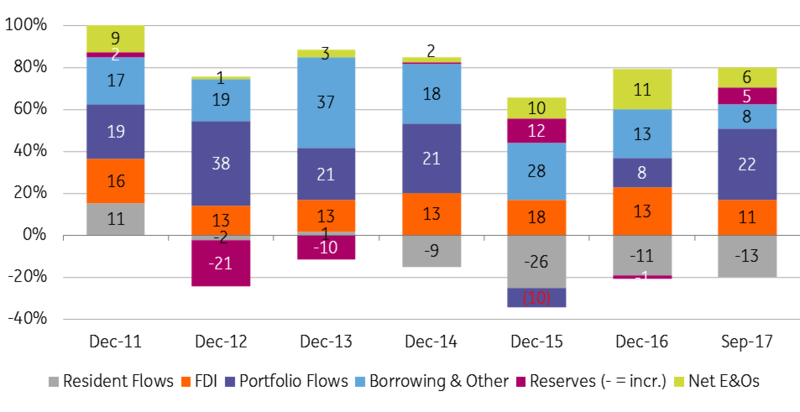 In September, debt-creating flows at USD3.9bn helped cover financing need from the current account deficit with still strong portfolio investments at USD3.4bn driven by 1) The Treasury’s USD1.75bn Eurobond issuance 2) banks’ bond issuance amounting to USD0.5bn 3) foreigners’ purchases in the bond market at USD0.8bn while they were net sellers in the equity market with USD0.25bn. Inward FDI, on the other hand, stood at USD0.6bn, somewhat below of the monthly average in recent years. Borrowing continued to remain sluggish as corporates repaid a net USD0.5bn, while the banking sector was a net borrower with USD1.2bn (USD0.8bn of which in long-term). 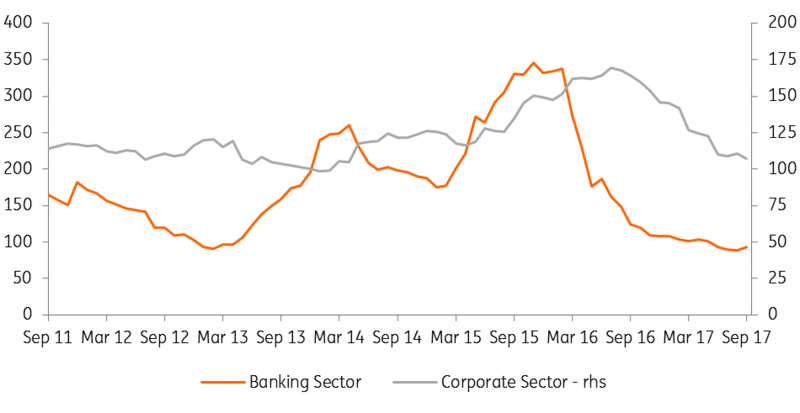 Accordingly, the long-term (LT) rollover ratio for the corporate sector dropped marginally to 107% on an annual basis that has been in a gradual downtrend since the failed coup attempt last year. The banking sector’s 12M LT debt rollover ratio, on the other hand, stood at 93% in September, broadly unchanged in the 2H17. All in all, the balance of payments data reveal a significant decline in net borrowing on an annual basis with increasing reliance on short-term financing since early-2016. Overall, the 12 month-rolling current account deficit has followed a fluctuating uptrend since the beginning of this year mainly due to developments on the trade side. In the remainder of the year, we expect the external deficit to gradually increase, given higher commodity prices on average over the last year and ongoing strength in core imports. The imports, however, are likely to lose momentum next year with moderating growth in the aftermath of reversals in tax incentives and fading impact of credit expansion as well as expected softening in energy prices.